If you like this post, subscribe via email or RSS. It’s mighty effective. It works for individuals in any country, in any industry, of any ethnicity and under any government. Millions of people now have the seed capital and tools to work their way out of poverty. I spoke with Windy Wilkins and Steve Schwartz from Unitus, a non-profit that works to increase access to microfinance services, to learn about Unitus’ specialized model (instead of working directly with borrowers, Unitus identifies high-impact microfinance institutions (MFIs) and helps them attract capital and systematize processes) and why the organization is so effective. Unitus-supported MFIs are growing seven-times as fast as traditional MFIs, and in its eight years of operations, the organization has helped its partner institutions to serve more than 10 million families. Wilkins leads the global network and Schwartz manages media relations. Windy: We partner with high-potential microfinance institutions. We currently have 23 partners to whom we provide a variety of services including help with capacity-building and seed or early stage funding. Are work is intended to help the organizations grow and deliver high-impact services to their clients. How do you identify high-impact institutions? Windy: We’ve surveyed 1000s of MFIs and have come up with only 23 partners, so it’s a rigorous process. We choose partners who are working in high-demand regions. Once we identify regions where we think there’s extreme need or potential for growth, we start to identify institutions. Typically, we partner with early-stage institutions. We also look for a commercial focus. We want to make sure the institutions are taking a commercial approach to microfinance. Windy: An organization that is dependent on donor funding and doesn’t have a plan to change that. We feel that in order for scale to be reached, there needs to be an element of commercial capital. An NGO-focused model that may be reliant on one or two major donors is also a more non-commercial approach. Are there any commonalities among the MFIs despite their geographic and cultural differences? How do they vary in terms of size, government support, aptitude? Windy: the commonality comes out when you look at the management. I’m responsible for running the network so I connect all of our partners to each other, find ways for them to share best practices and learn from each other. Every year we do an annual leadership summit that brings together the CEOs and senior management of our partners. I’m always surprised by how much commonality there is among them. When you look at their capability and their passion, they have a lot in common. What do you specifically offer your partners and how do you develop these programs? Windy: We offer functional consulting in human resources, technology and operations. These three areas were chosen based on needs that we saw as essential to helping these businesses grow. In operations for example, we work with MFIs to become more efficient, to streamline costs and reduce operational expenses. This ranges from analyzing the cost of customer acquisition to teaching middle management project management. How much tweaking do you need to do for programs for each region? Windy: there’s always some tweaking involved, particularly as we work more in East African, where the institutions are generally younger than in India. What’s a signature program for Unitus? Windy: I was recently in East Africa providing support to our East African Growth Center, which is a leadership development program for MFIs in Tanzania and Kenya. There are 11 MFIs participating. We conduct growth workshops to help CEOs become better leaders and grow their organizations. Part of this is helping them develop strategic plans. Initially, some of the staff didn’t see the value in strategic planning. It was the first time they had been through an exercise like this. Giving them the opportunity to think through what their organizations’ missions and goals would be for the next year helped them feel more connected to their institutions and inspired in their ability help people. Most of the Unitus team, which is small, is located in Seattle. How do you effectively work with your local partners? Windy: We also have offices located in Bangalore and one in Nairobi and our staff there works very closely with local partners. Steve: Windy’s being modest. She and her team spend a good portion of the year traveling and working closely with our partners as well. Unitus-supported MFIs are growing 7-times as fast as those not affiliated with Unitus. What do you attribute your success rate to? Windy: We have these great early-stage partners with high potential for growth. We’ve found institutions that are the best and brightest in microfinance. A lot is owed to our rigorous selection process. Once we’ve selected our partners, we take a needs-based approach to help them reach their goals. Having team on the ground helps as well. Steve: Unitus has not shied away from innovation–whether it’s the delivery of microfinance through the MFIs or innovation in the marketplace to discover new ways to capitalize MFIs. Do you have to customize training programs specifically for each region? Windy: We’ve found that we can take much of what we’ve developed for India and use it with our new partners in East Africa. Microfinance operations are similar across regions so we’ve been able to apply our knowledge about operations and technology in both geographies. With mobile technology, for example, we are able to take what we learned in Africa and apply it to India. Do you see others adopting the Unitus model? Windy: I don’t see anyone replicating our emphasis on early-stage and high potential institutions in the short-term because it’s a little bit risky. There are a lot of players in the microfinance space but not a lot who provide capacity-building support as well as seed capital. Steve: Microfinance is a very diverse area. As it grows, it becomes more complicated for one organization to serve all of the needs. We’re focused on expanding early stage MFIs and creating more opportunities for empowerment. Everyone’s playing a slightly different role; we’re not to the point where there is genuine competition. What drew you to microfinance? Windy: I’ve had a long-time interest in development, but what attracted me to microfinance is its potential for impact. I’m a firm believer in grassroots, bottom-up approaches to development. Getting money in the hands of people who need it and who have the potential to lift themselves and their families out of poverty is really exciting. Steve: I got a degree in international relations and public diplomacy and I took that down to Wall Street to misuse it for a couple of years representing hedge funds. I then went into the Peace Corps and ended up in West Africa and Benin and did microfinance with a lot of women’s groups. 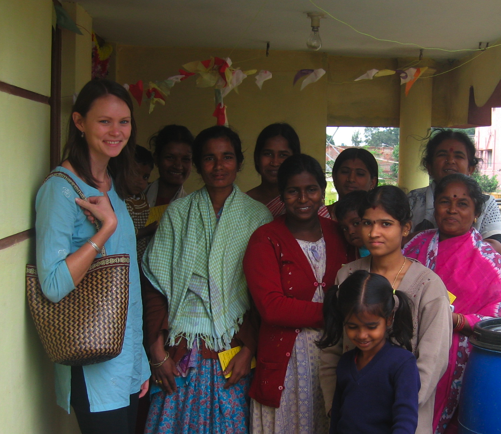 I saw the potential impact microfinance had on these women’s self esteem and identity. The add-on effects of microfinance were fantastically profound when you saw them in action. Now I’m working to tell the microfinance story at Unitus. What do you suggest to people who are interested in microfinance? Windy: Go work in the field, work for an MFI. But I recognize it’s not something that everyone can do–that wasn’t the route I took. Steve: There’s 10,000 MFIs worldwide. Even being in one that’s failing miserably, you get to see what the advantages and challenges are. You and your readers may be interested to know about a new documentary film world premiering at the Sundance Film Festival this month about Grameen Bank America and Dr. Muhammad Yunus’ work with microfinancing. “To Catch a Dollar: Muhammad Yunus Banks on America” is a film directed by Gayle Ferraro which follows women in Queens who are improving their lives through microfinance loans. The film does a good job of explaining the concept of microfinancing and the organizing principles of Grameen Bank. Keep your eye out for this interesting film! I'm Olivia Khalili. I created Cause Capitalism to show you how to grow your business by incorporating a social mission. I've worked extensively with both nonprofits and for-profits. I found that when you combine the two, you grow your profits, impassion all your stakeholders and do good in the world. Read more. © 2019 Cause Capitalism. All Rights Reserved.